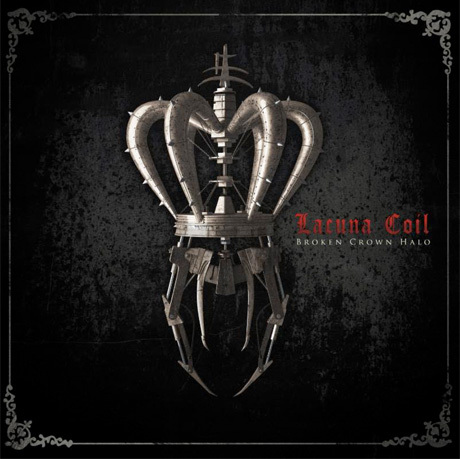 Following bittersweet news last week that Lacuna Coil guitarist Cris "Pizza" Migliore and drummer Cristiano "CriZ" Mozzati had left the band, the Italian metal crew have revealed a spirits-lifting lyric vid behind their Broken Crown Halo's "Nothing Stands in Our Way." Shaky visuals of the album cover's metal crown and a promo pic of the band act as the backdrop for the clip, as singer Cristina Scabbia lays out lines about never giving up the struggle to survive ("our eyes are burning but we're never slowing down") atop a synth-strewn verse. The band's blend of gothic keyboards, distorted guitar chugging and mosh-instigating beats take over from there. You can check out the lyric video down below. As previously reported, Broken Crown Halo is described as "a dark vision of a near future when survival is second nature." The new LP arrives April 1 through Century Media Records.